Conditions: Most of the tarpon and snook action is in the sounds and along the beaches. The back country is still providing some good redfish action and there are some small snook and as always, seatrout. Water quality is diminished a bit and salinity has dropped on the southeastern side of the Harbor due to some much needed rainfall. The beaches will be a mess mid week with the SSW winds that are coming. Fishing tactics: The sightfishing window in the back country is pretty small this time of year. Just when the light get good the reds and snook are heading for the shade and cool of the mangroves. Go early and blind cast for best results. As for Tarpon; there are pods of them in the Harbor if the beach is unfishable. Go early and watch for rolling fish. When the stop rolling look for them in close by deeper water. 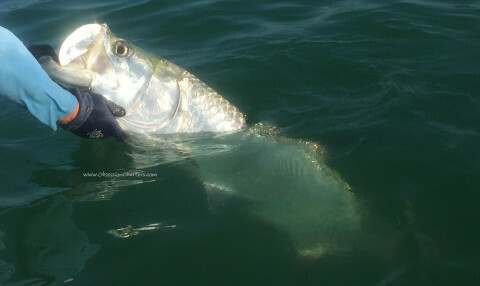 My fly fishing tip of the week: The tarpon seem to be more interested in old reliable patterns as of late. Pick your favorite color and change it every time you get a refusal. My spin fishing tip of the week: Tarpon are eating crabs pretty consistently. But load up on pinfish and whitebait. Keep changing things up and you'll get them to bite. 7 day outlook: Monday and Tuesday should be great fishing. Weather will be an issue mid week with strong SSW winds showers and storms. Hopefully by Friday the front will pass and the overnight wind will shift back out of the east.